Henderson Island, one of the Pitcairn Islands in the far reaches of the Pacific, is one of those islands that you think only exist is stories; an uninhabited tropical island in the middle of the ocean colonised only by rare birds, hermit crabs and surrounded by a stunning coral reef. However, Henderson has been in the news lately for all the wrong reasons. Although it is one of the remotest islands in the world it also has the title of having one of the most heavily polluted beaches in the world. Long-lived plastics debris is constantly being washed up onto the beach and a recent study by the University of Tasmania and the RSPB calculated that 27 new items of plastic wash up on every meter of beach per day. The nearest inhabited island of Pitcairn, with a current population of 48, is both not responsible for the levels of pollution and cannot hope to deal with the problem themselves. Henderson Island lies on the edge of the South Pacific gyre, a giant circular movement of water moving anti-clockwise across the whole of the South Pacific. It is this oceanic current which brings the plastic pollution from the surrounding nations of the Pacific Ocean into contact with Henderson Island. 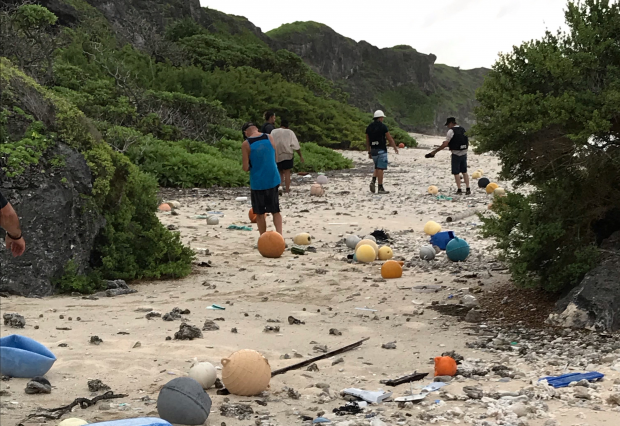 Plastic waste dumped into the sea or accidently lost within the South Pacific will ultimately find its way into the gyre and will eventually pass by Henderson with many items washing up on the beaches. 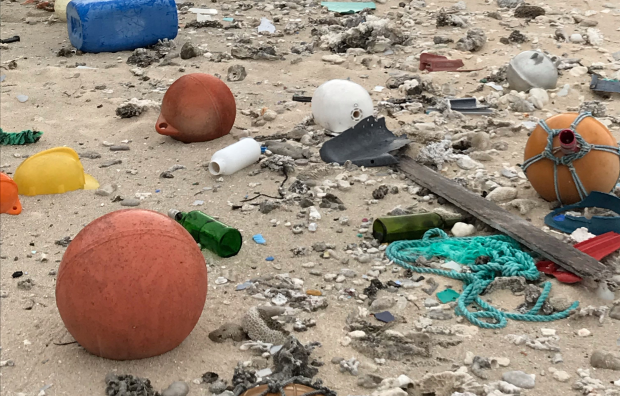 In June 2019 a group of scientists, journalists, film makers and artists are taking part in an expedition to Henderson island to investigate the plastic pollution problem and to highlight the plight of this otherwise pristine environment to a global audience. The scientific team includes scientists from the University of Tasmania, the UK Natural History Museum and the Centre for Environment, Fisheries and Aquaculture Science. The Blue Belt programme is providing financial support and scientific expertise to the expedition as well as supporting the Pitcairn Island community in bringing this to the attention of the world and finding solutions or mitigations against the levels of plastics. Scientific investigations will focus on both the terrestrial and marine fate of the plastic pollution. On land the scientists will be looking at the quantity of macro and micro plastics, the rate of accumulation and the impact on the local wildlife. On the water the scientists will be looking at the impact of plastics on the surrounding coral reefs and seabed sandy habitats, collecting samples of water and sediment for the analysis of microplastics. The levels of pollution will also be captured in documentaries and editorials created by the team while on the island and then broadcast across the internet and through national media outlets. The hope is that through scientific investigation and the highlighting of the problem through the various media outputs it will encourage more international action on the problem of plastic pollution and be a driving force for change in the coming years.